GETTING TO WHERE YOU WANT TO BE IS EASY; SOUTH GIPPSLAND HIGHWAY IS DIRECTLY ACCESSIBLE FROM HUON PARK ROAD AND CLOSE TO THE MONASH M1 FREEWAY. UPGRADES TO THE CRANBOURNE-PAKENHAM TRAIN LINE WILL INTRODUCE MELBOURNE’S FIRST HIGH-CAPACITY TRAINS BY 2019. MERINDA PARK TRAIN STATION, CASEY RECREATION & AQUATIC CENTRE (RACE), CASEY INDOOR LEISURE COMPLEX AND CASEY FIELDS ARE JUST DOWN THE ROAD. A HUGE CHOICE OF SCHOOLS AND SHOPS ARE AT YOUR DOORSTEP. 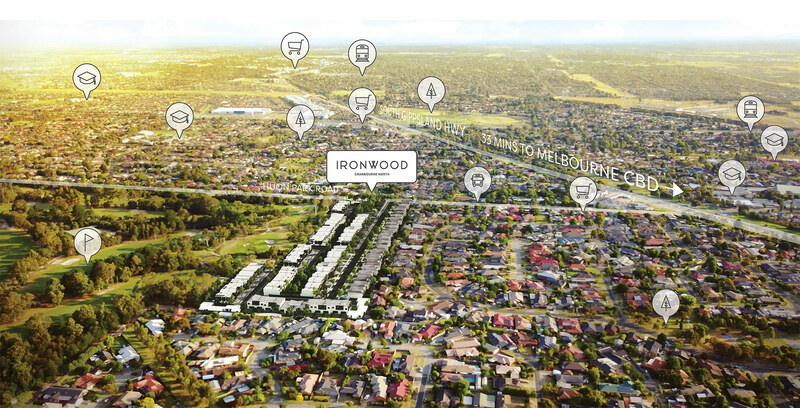 IRONWOOD IS LOCATED IN THE SUBURB OF CRANBOURNE NORTH AND IS THE IDEAL PLACE TO SETTLE DOWN. YOU’LL FIND NO BETTER MARRIAGE OF CITY AND COUNTRY, POISED AT THE NEXUS OF METROPOLITAN MELBOURNE, THE DANDENONG RANGES, AND THE MORNINGTON PENINSULA; BE CLOSE TO THE ACTION, BUT FAR FROM THE CRUSH. IRONWOOD IS IDEALLY LOCATED TO TAKE ADVANTAGE OF THE CITY OF CASEY’S MANY AMENITIES, INCLUDING THE NEARBY CRANBOURNE ROYAL BOTANIC GARDENS. JUST MINUTES AWAY IS CASEY CENTRAL SHOPPING CENTRE AND JUST AROUND THE CORNER IS THOMPSONS PARKWAY SHOPPING CENTRE. 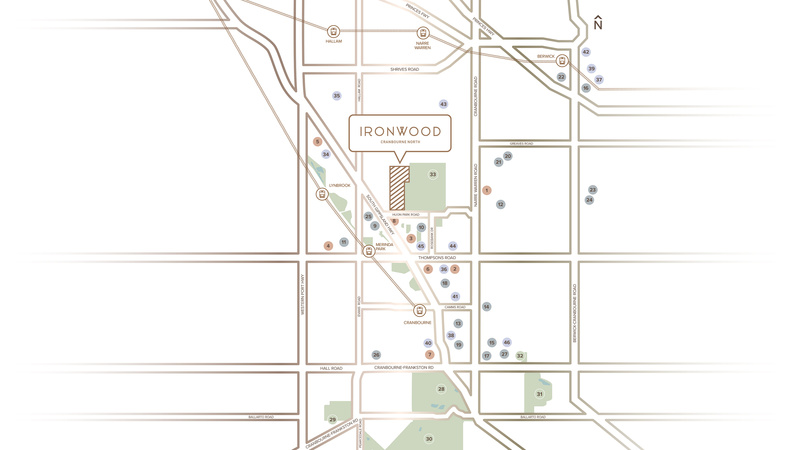 PREPARE TO BE SPOILT FOR CHOICE, WHETHER YOU’RE LOOKING FOR SCHOOLS, SHOPS, FOOD, OR ENTERTAINMENT ACTIVITIES; IRONWOOD WILL OFFER EASY ACCESS TO ALL.